Ikokore is a type of pottage dish peculiar to the south western people of Nigeria particularly Ijebu natives in Ogun state. In fact, it is the signature meal at most Ijebu parties; you know it is an Ijebu party when Ikokore is on the menu. It is also called Ifokore and is made with water yam. Water yam is also called wild yam goes by the botanical name Dioscorea Alata, and it is a mucilaginous plant. In Yoruba it is called Ewura. Water yam pottage is also a native meal in some parts of Southern Nigeria more common among the Calabar and Akwa Ibom people. However, there is a slight difference between the way water yam pottage is prepared in these two locales. 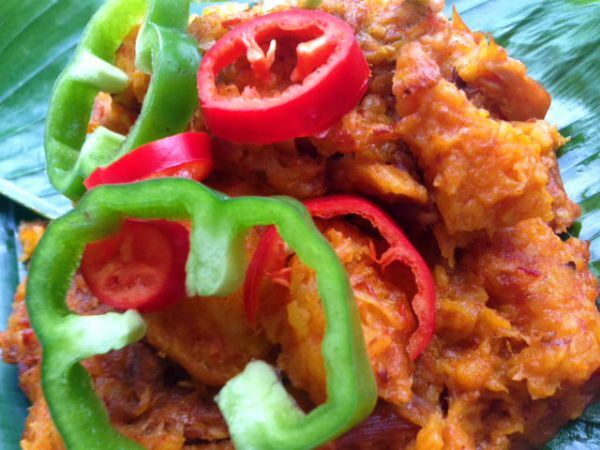 The Southern Nigerian natives prepare their water yam pottage in two different ways. One with only water yam and the other with both water yam and coco yam. The latter is called Ekpang Nkukwo while the former is called Otoh Ebere. The ingredients for cooking this dish include grated water yam, chicken or beef stock, dried fish, cow stripes, smoked fish, palm oil, habanero peppers, cray fish, seasoning. Ikokore isn’t at all difficult to prepare. All you need do is peel and cut the water yam into small sizes, and grate each cut piece using the finest part of the grater then cook like you would a normal pottage. Modern living and technology has made things easier. You could just blend the yam with a blender. One important tip when preparing this food is to cut the water yam into large chunks and not small bits in order to prevent cutting your hands on the grater because of its slimy nature. Ikokore contains nutrients and minerals like potassium, phosphorus, calcium, iron, copper and is very helpful in relieving digestive health problesm like constipation due to the high fiber content. The main constituent of this dish which is water yam has lots of antioxidants with vitamins like E, C and B vitamins as well. Some of the benefits of consuming this dish includes, reduction in blood pressure levels, regulation of blood cholesterol level and blood sugar level (great for diabetic patients). As a result of these antioxidants, this dish can help control the damage caused by free radicals thereby slowing down the aging process. If you have hormonal imbalance as a female, this meal is good in regulating hormonal imbalance and monthly periods. Ikokore is digested and absorbed slowly, and therefore keeps you full for longer and avoid blood sugar level spike which makes it great for people on a weight loss diet. Some persons add vegetables to their Ikokore just like the regular Nigerian yam pottage (asaro) which makes it healthier. You could either eat Ikokore alone as a main dish or eat it with eba (cooked garri) as the Ijebu people sometimes do.